School's (been) in and the team's (been) hard at work. 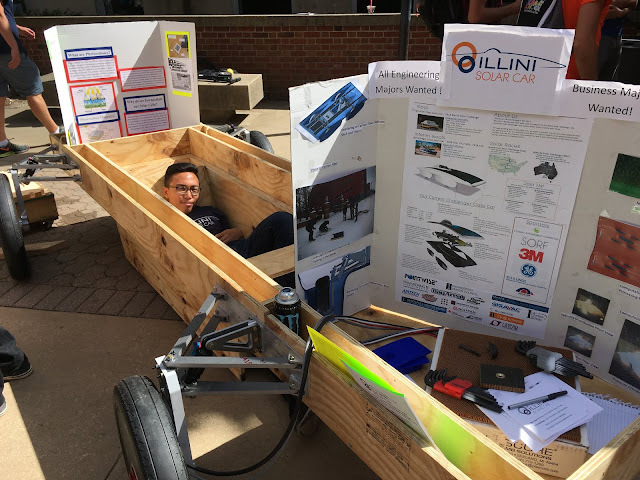 After a successful summer of learning, building, and progressing with the car, we wanted to maintain our momentum to carry us through to have a strong start to the semester. And if you keep reading, you'll find out that yes, we've done just that. 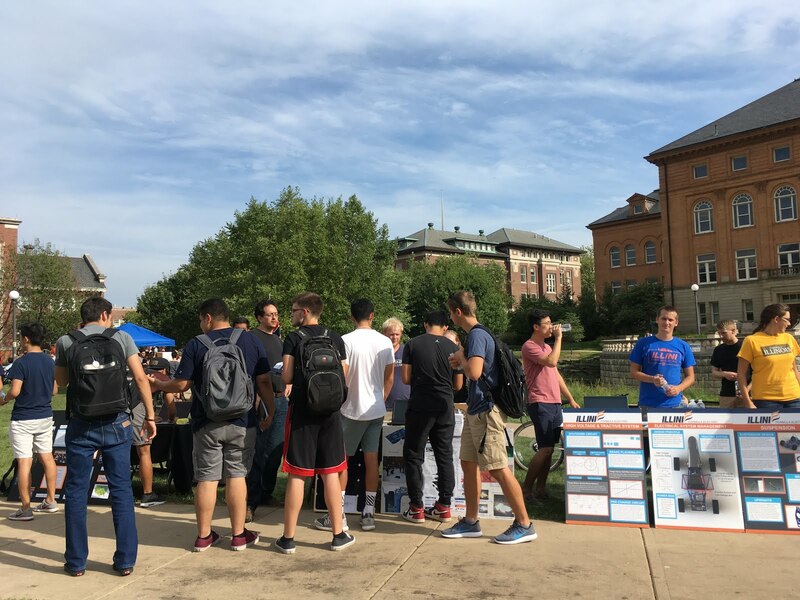 Quad Day is, without a doubt, one of the best times of year to attract the attention of potential members. 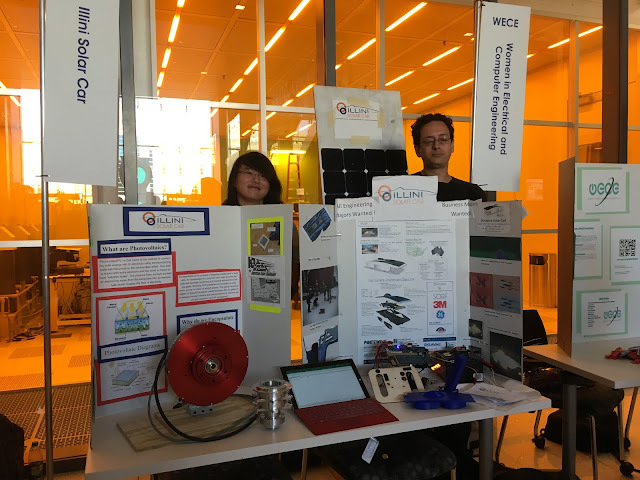 And what's more eye grabbing than a 6' tall solar array, a mock chassis with legitimate suspension, various tangible/playable electronics, and most importantly, enthusiastic team members? Sunny skies with a bit of clouds make for the best Quad Day weather. Here we see various members from all our main subteams ready to engage with interested and potential new members. Not only was our mock chassis eye-catching, it was also a nice place to sit in the shade, as well as act as a table for many of our informative posters and playable gadgets. 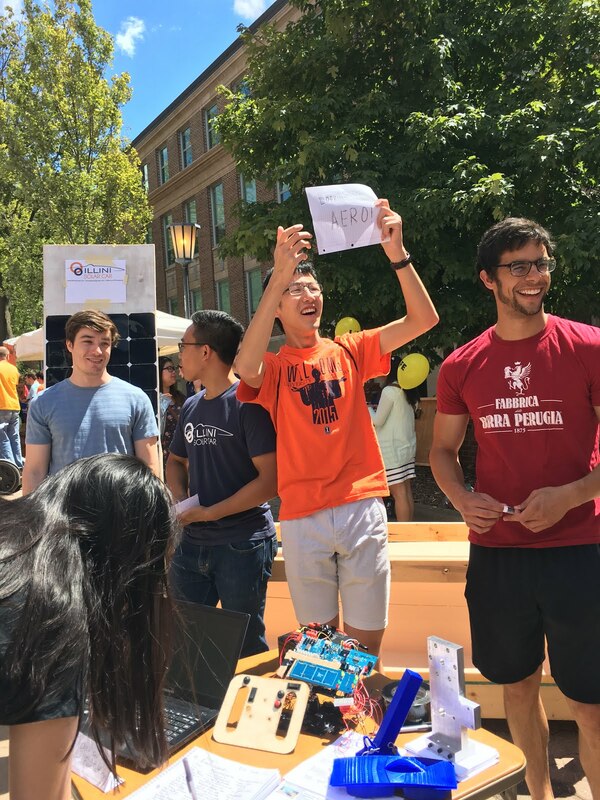 Smiles all around as one of our aero members enthusiastically held up a sign calling to any students interested in aerodynamics. Also pictured are some of the electrical components that people could interact with. Mainly present were the prototypes of the steering wheel, dashboard, and brake pedal. Beyond the famed Quad Day however, there are still more opportunities at the beginning of the year for organizations like us to reach out to students. And you bet we were there! So we couldn't have the curiosity-inspiring mock chassis in the ECEB for ECE Ignition. But we were able to display everything else in addition to our sleek looking, equally as eye catching red motor. And here we are at the engineering's own little Quad Day, E-Night. You can barely see our members and table on the left because there are so many interested people around it! All of our persistence led to two decently packed informational nights and record numbers of people interested in the team. We got a new work space! Thanks to a very kind sponsor, we've upgraded from the 3 self storage units that served as our main operations base over the summer to a large, coherent work space. Equipped with lights, a bathroom, and some friendly neighboring businesses, it's a much better location for us to produce great things. After moving in our gargantuan foam molds in, we wasted no time in getting the space set up for working by building various tables and shelves, and then got back on track to building the necessary structures to continue working on the car. About 2000 sq. ft. of emptiness was quickly and surely filled to make the place much homier and workable. A little rain doesn't stop us from getting the job done. But we definitely make sure that not only are our sensitive foam molds safe from the water, but more importantly that our members are safe from slipping and other hazards too. Can't stop, won't stop. Here a member is fixing minor damages to the foam mold that result from machining. It takes quite a bit of patience and fine motor skills to perfectly apply body filler, acrylic putty, and various other fillers in just the right amount. 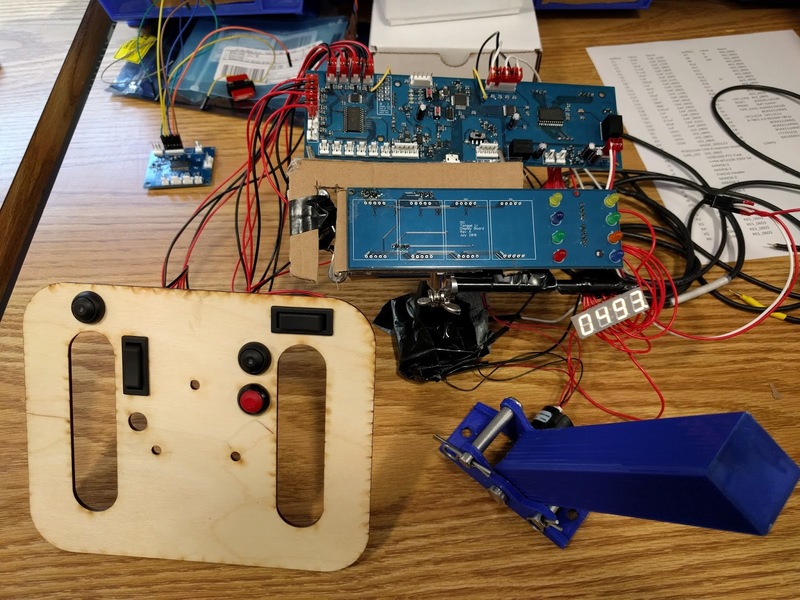 And as we previously mentioned, the dynamics system on the mock chassis is fully functional and could very well be used on the actual car when the time comes. 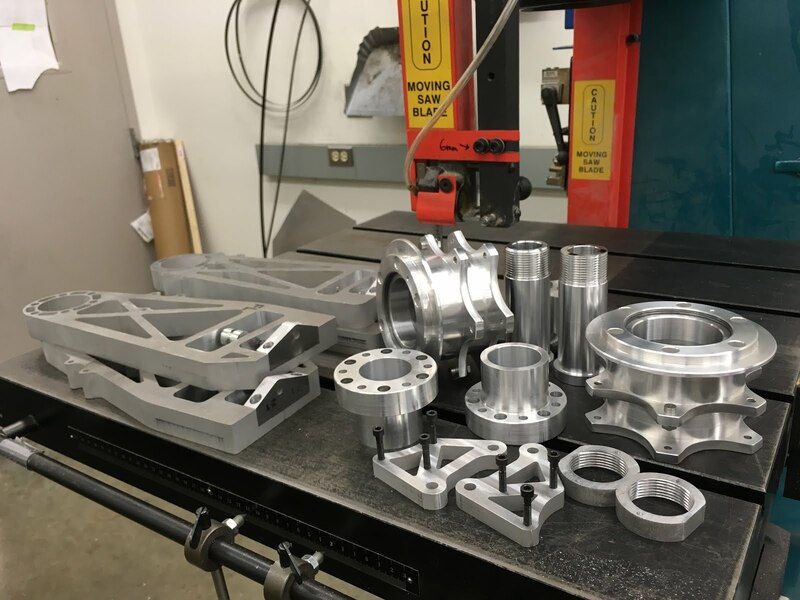 A mix of blood, sweat, and tears (or maybe just sweat) combined with water jetting and tireless machining is how these beautiful aluminum parts came about. 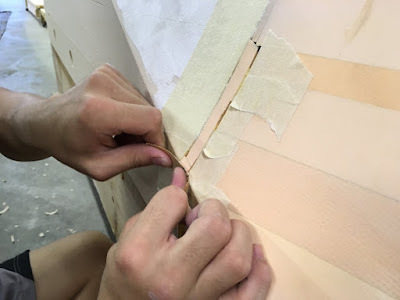 The composite/shell fabrication team's plans are focused on making the actual shell. This involves first repairing any damages to the molds and sanding them smooth, then priming them, and finally, laying up carbon fiber and core materials that will ultimately be the car's exterior. 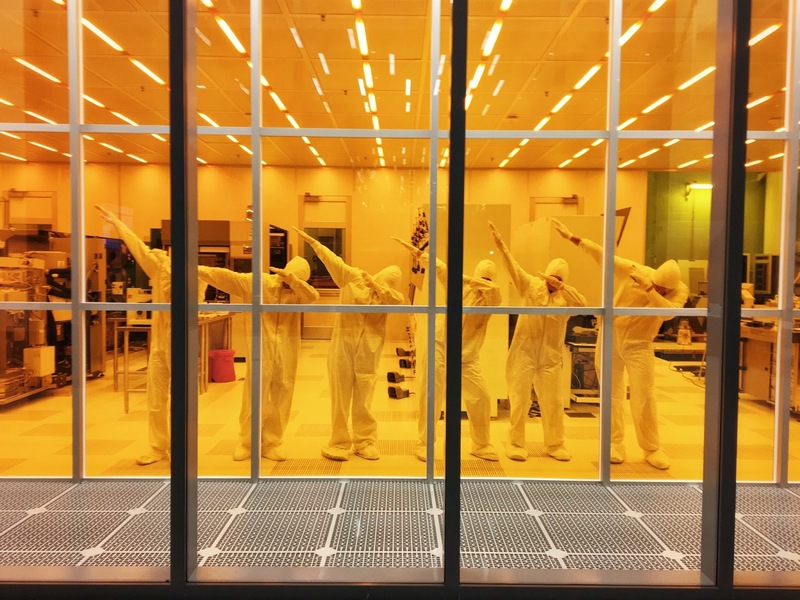 Other, more specific interests include the computational analysis and testing of our materials in order to get a better idea of how they will perform in the real world before we create them on large scale. Similarly, the dynamics team is working to also simulate the the effectiveness of the machined parts through simulations and are looking to find ways to improve them so we have a faster and safer car. 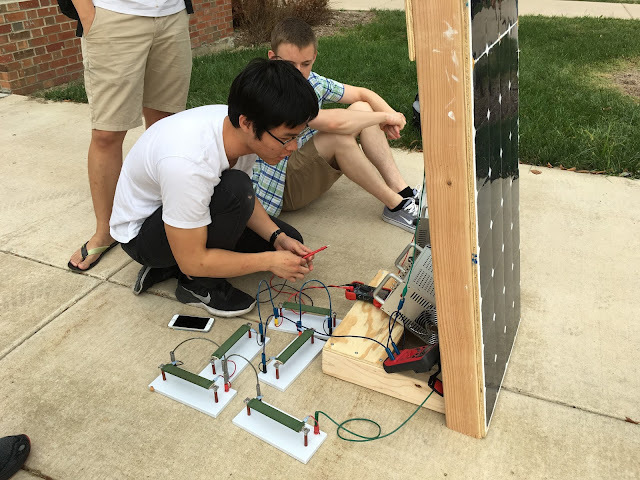 One of our main focuses this semester is the battery box. We'll have an array of 28 15-battery banks lined up inside the box with circuit boards and large relays on the sides. The previous battery holder was too large, so we designed PCBs to handle the connections for the voltage and temperature data collectors, while also holding the batteries in place. Thinking ahead, we need to decide how to handle the data from the temperature sensors and find out if there is an alternative to spot-welded nickel tabs. Senior members prepare the newcomers for an especially productive semester. The other main goal is the test bench. This will allow us to plug in different boards and measure how they react to simulated situations like low power from the solar array. It will also serve as a step-off point for the complete system which will go into the actual car. 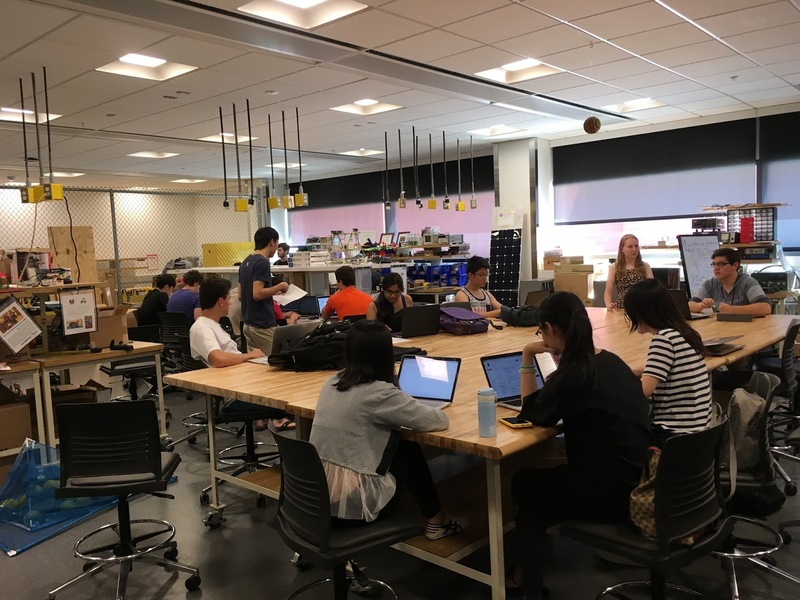 Compiling this system requires a lot of people to know individual systems, so it's great that we have enough people who are eager to learn that it should be completed by the end of the semester. Soon, hopefully, our subteam will no longer be the only expert on each board, and we can start effective information transfer to the new members. First revision of our dashboard. Second revision of our dashboard. We've made great progress since the beginning of the semester. The team now has nearly all post processing automated using a tool called PyFoam. We are also close to fully automating our meshing processes thanks to a generous donation from Novus Nexus. In the near future, this automation will open up more time to analyze results and generate new concepts. Regarding new members, we've been using CAD as a means to get them up to speed on general sub-team operations while also planning for future competitions. We’re currently training them to use PTC Creo so that they will be able to start modeling the next generation vehicle by the time the current one is finished, if not sooner. We're also introducing new members to computational fluid dynamics (CFD) by studying the Ahmed Body case. Solar module encapsulation training has been progressing within the clean room for two weeks, so team members are getting more acquainted with the process and some are honing their soldering techniques. The heating of the cell arrays within the autoclave has been fixed after various modules and tests encapsulations during August and September. We are also looking into constructing our own “heat press” oven for encapsulation so we don't have to rely on the autoclave as it can be difficult to schedule. 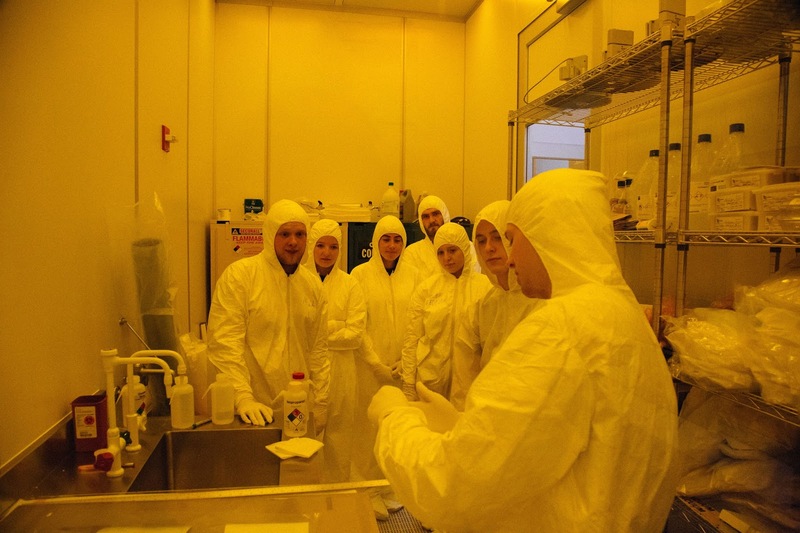 New members being instructed on how to prepare the solar cells for soldering in the clean room. Celebrating one of the first of many nights hard at work as a team in the clean room, members "dab". Top film adherence has been mostly consistent over recent tests, though we are still considering alternatives hoping to get better results. And last but not least, some members are working on the IV curve tracer so stay tuned for the results of our module performance tests! We got off to a very successful start to the semester. Most notably, we were excited to meet with Chevron Phillips Chemical (CPC) and Molex Electronic Solutions. We learned that CPC only recently started recruiting on our campus, so we were grateful they took the time to meet with us after the Engineering Career Fair. Over dinner at Firehaus, we enlightened the CPC representatives of the enthusiasm that our engineers and business students have for the project, while also establishing a more consistent means of communication that we hope will only be the start of a productive relationship. More recently, we also had the opportunity to meet with Molex and similarly realized a great chance to develop a relationship with some of their mechanical and electrical engineers as well. In the future, we hope to maintain and improve our relations with donors and also show our new work space to them if they are interested. Due to the growing nature of our team, not only population-wise but also location-wise, it can be a bit difficult to connect with people in different subteams. In an attempt to maintain more team cohesion, we're trying to organize an occasional team-wide social event. Our first run was a cookout at the new mechanical team work space - inspired by other car teams doing something similar - and was ultimately quite successful. Members from every subteam, newcomer and seasoned alike, were at our gathering to enjoy good food and company. 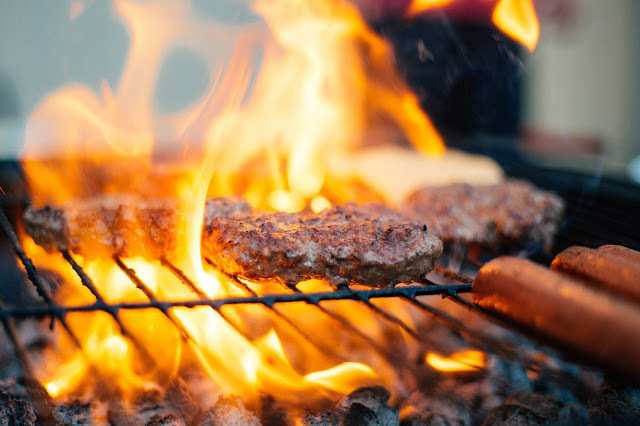 We've got a pretty good photographer on the team who makes these burgers and hotdogs look just a bit better than they actually taste. Not picture is everyone's favorite DIY chicken wings.